Imagine your car running without an oil filter. Can you really run it as smoothly as you wish? Is it possible to maintain its health for a couple of days without this component? If your answer to the above questions is ‘NO’, keep reading. It is true that when specks of hard substances find their way into the oil stream, they can cause serious damages to the machinery of your car. Eventually, the normal functioning of your car will be sabotaged. But then, which filters can get you off the hook and how do you single out the best ones? Car owners most often land on conflicting pieces of advice when it comes to choosing car oil filters. The installers, mechanics, car manuals, quick-lube operators, and retail clerks all give varied opinions. The bitter truth is that when it comes to oil filters, there is no one-size-fits-all approach. To reduce the kind of confusion you could be sailing in, we will first invite you to our review of top 10 best oil filters and subsequently, take you through a buyer’s guide. Please, read along. You could be wrong to conclude that the best oil filter must be the most expensive. Despite being pocket-friendly, Motorcraft FL820S Silicon Valve oil Filter offers very good and long service. It is designed to work with Lincoln, Ford, and Mercury automobiles. As long as it can fit in your car, it will always serve you best. In addition to being of lightweight and easy to handle, Mobil 1 M1-110 also enjoys the best rating from customers and professionals. It is a high mileage filter with a dirt holding capacity of 28 grams. It also has an advanced synthetic blend filtration media in addition to a multi-pass rating, making it 99.6% efficient. This wonderful oil filter has an exclusive Filtech media technology, making it a great oil filter for cars. It is capable of screening out more contaminants thereby providing better engine protection. It has a strong steel base and plates that prevent leaks and poor fits. 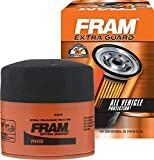 Oil filters from Fram are always known for their affordability and PH7317 Extra Guard is no exception. This device is designed to work with a variety of conventional oils. It offers engine protection for up to 5,000 miles. It also provides ideal balance dirt holding capacity and the efficiency of dirt trapping. 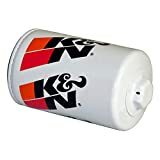 K &N HP-1008 is best for those intending to replace the filters for their cars, SUVs, Trucks, and motorcycles. It has a heavy duty construction that ensures it can withstand extreme conditions. It also has a rasin-impregnated media which traps up to 99% of the harmful contaminants. Bosch 3330 Oil Filter is yet another affordable yet effective automobile oil filter that offers great service for several miles. It has a dirt capacity of 14 grams which is practically good considering the cost of the filter. It also features a silicone anti-drain back valve that eliminates dry starts through a good supply of oil when the car is started. The efficiency level of Motorcraft FL910S Engine Oil Filter is what makes it one of the best on the market. It has an increased dirt trapping capability and as such, can trap more engine-harming contaminants. It also features a silicone anti-drain back valve. This prevents the oil from draining out of the filter and engine when the vehicle comes to a halt. This is one of the best oil filters on the market that practically enjoys the confidence of the majority of its users. It is also one of the cheapest. In plain English, you will not only get the best quality but will also save some good chunks of money in the process. 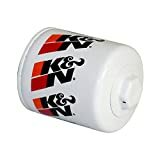 Whether it is a highly durable construction or high filtration efficiency that you are looking for in the best quality oil filters, K&N HP-2010 has you covered. It has a heavy-duty construction that enables it to withstand high pressure in addition to minimizing wear. This ensures your engine is protected for a long time. If you are looking for a high mileage oil filter then Bosch 3312 Premium is your best remedy. It has strong steel housing and base which collectively prevent possible leaks and improper fits. It also uses a silicone anti-drain back. This offers protection against dry starts and prevents a dry-out. As we promised you that we would take you through a buyer’s guide at the end of top 10 best filters’ list, we are here to fulfill our promise. So then, what else really matters when purchasing oil filters for your car? Just a handful of companies are known for making incredible oil filters. To be sure you are buying the right filter; you should always closely inspect the shape and construction of the can. The base plate normally reveals the manufacturer of the filter. Be sure to settle for nothing less than a brand that is well known for effective oil filters. The dirt-holding capacity gives information concerning service life ahead of going into bypass. This is very important especially to those intending to extend oil drain without doing a midpoint oil filter change. It is equally important for those who normally drive their cars on gravel or dirt roads. This safety margin is of great significance considering that car oil filters have no indicators to tell the car owner when oil is bypassing and not being filtered. Taking good care of your car only adds life to it and gives you a smooth drive. When you choose the best oil filters, you are sure to control the particles that occasionally find their way into the oil system and eventually causing problems. Insist on our top 10 best oil filters review for a chance to always get the best on the market.